Spinzilla has started and thousands of spinners world wide have already begun spinning! In our team, Sue's Stupendous Spinner, our ladies in Sweden started first...then, as it turned 12:01 a.m. across the globe, we all took to spinning. I have been so excited about Spinzilla. My goal is to spin in Spinzilla every year that I am capable of spinning. It has taken me 8 years of therapy to be able to spin after my joints locked in 2007 so this will be a huge accomplishment for me. Being a disabled spinner, I have some obstacles that will need to be overcome. My legs spasms which means, sometimes I can spin and it helps and sometimes it gets so bad, I cannot move them at all. I have limited energy which means my spin time will be regulated by what my body allows me to do. My upper body issues will come into play. While I love to spin, there are issues with the nerves in my hands, arms, shoulders and back that will probably act up and will have to be addressed but prayerfully won't slow me down. 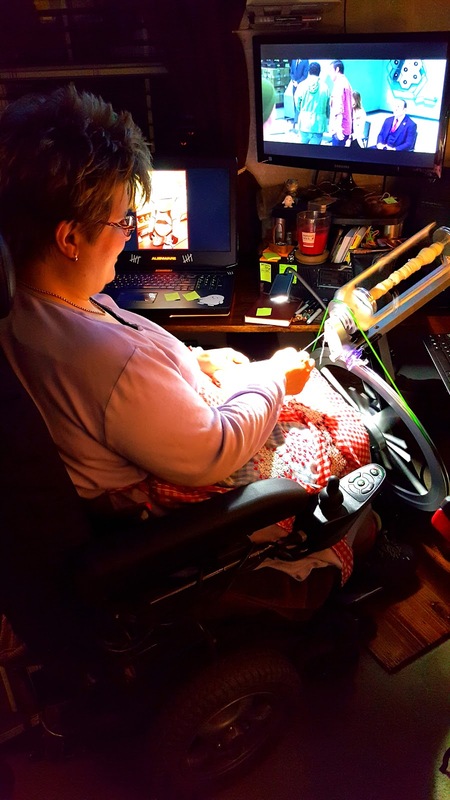 I would like to say these concerns are just because I am spinning in Spinzilla but, as those of you brothers and sisters that also share a disability know, these are the concerns we face every single day of our life in every single activity we desire to do. I can tell you I am very disappointed. My back and neck have decided to pick today to flare and it is making it hard to spin, but I will persevere! Part of spinning is to say, even with a disability, I can still participate! I may not spin as much, I may not spin as fast, but I can spin and I hope all of you struggling out there remember, we can make it! We can do anything we set our minds to, all it takes is determination! Our daughter was good enough to massage my back and neck to loosen it up and then applied trigger pointing to let the tension out of the muscles to relax a little so I can sleep. I will be starting again, bright and early! I will be blogging my process as a disabled Spinzilla Spinner on our website, Healing Fibers Foundations,,,, www.healingfibers.org Don't worry, once up, we will be giving you a link on FaceBook as well! Healing Fibers wants to remind all you spinners out there to never give up. Whether you are using a Spinning Wheel, a Spindle or a Hansen Minispinner (Can you tell I'm a bit envious about the Minispinner? It's on my wishlist!) no matter how you are spinning, or knitting, or weaving, you are doing something very special. You are not just producing something beautiful, you are taking control of your life, your pain and your illness and overcoming. Each little step builds and makes us stronger! So, Spin!!! And, if you are with me and are a disabled Spinner through Spinzilla, we would love to hear from you!